…I digress. Pumpkin Lasagna, voila! In a large pot, boil water and cook noodles until they are bendable but not quite al denté. Rinse with cold water and keep submerged until you use them. In a small skillet, saute the mushrooms, onion and 1/4 teaspoon salt in the oil until tender; set aside. In a small bowl, combine the pumpkin, half-and-half, sage, pepper, and remaining salt. Spread ~1/2 cup pumpkin sauce in an 9in x 9in. baking dish coated with cooking spray. Top with three noodles (snip off approx. 2″ of each noodle so they fit in the dish). Spread ~1 cup pumpkin sauce to edges of noodles. Top with half of mushroom mixture, 3/4 cup ricotta, 1/2 cup mozzarella and 1/4 cup Parmesan cheese. Repeat layers. Top with remaining noodles and sauce. Cover and bake at 375° for 45 minutes. Uncover; sprinkle with remaining Parmesan cheese. Bake 10-15 minutes longer or until cheese is melted. Let stand for 10-15 minutes before cutting. Yield: 6 servings. Result: Mr. P and I agreed…this recipe was either going to be a good one or a complete bust. And…it was good! Really good! The recipe reviews all said to use more mushrooms and the recipe needed more sauce, so with both of those changes, it was great! I love that the lasagna is carbohydrate friendly and high in protein despite being a vegetarian entree. The 7.5 grams of fiber is a bonus, too! Be sure to let the lasagna sit for AT LEAST 10 minutes…15 is better. Mr. P said he enjoyed it, too. He said it wasn’t THE BEST recipe ever, but he liked it and ate every bite. I’d say that’s a success! Question: What’s your favorite way to eat pumpkin? Would you think you would like pumpkin lasagna? Hahah I would like this, but I’ve seen it before and always tell my husband it would be his worst nightmare – he hates pumpkin, ricotta and lasagna! Yum! 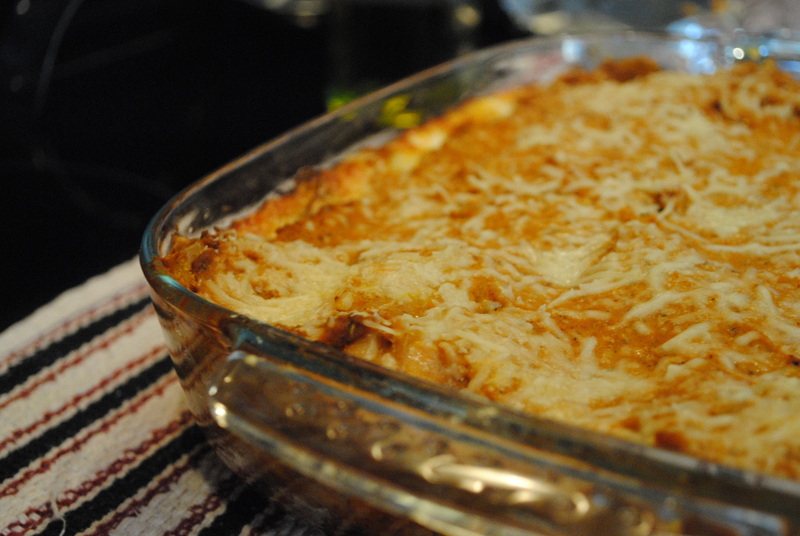 MY favorite recipe for lasagna is actually a pumpkin white bean variety. I’m serving pumpkin bread for dessert tonight 🙂 With vanilla ice cream, of course. That is, if we don’t go to dinner…. to be lazy, or not…that’s the question! We have been using zucchini in place of lasagna noodles and it is divine. Just run the zucchini through the mandoline the long way to get sheets and follow the recipe. It’s been a great way to use those giant zucchini from our garden. We just peel the tough skin off and avoid the center where the seeds have started to mature. I love pumpkin lasagna. 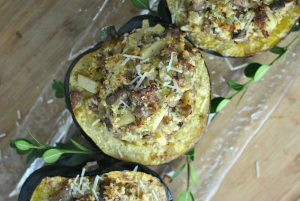 I make mine with sausage, zucchini, and pumpkin and now it’s become a fall staple. Yum! This looks really good! I really want to make this since I love love pumpkin and mushrooms. I’m making a pumpkin risotto tonight for dinner but am excited to try out your lasagna recipe. I love fall!!! This looks so yummy. I love my pumpkin chocolate chip pancakes and pumpkin spice cake. So healthy and good! I also do a pumpkin sauce over raviolis but will definitely try this lasagna. Thanks! It’s no secret that I love pumpkin… in oats, yogurt, lattes, pies, muffins, breads, cookies, bars, etc. I am planning to experiment with savory pumpkin dishes this fall, and this lasagna sounds yummy. I’m going to make a pumpkin mac & cheese soon – hopefully it turns out well! That sounds good. It reminds me of pumpkin ravoili, which I love. Still, my favorite lasagna is the plain old marinara one. I don’t eat it often–because it’s so unhealthy–but sometimes when I’m out at an Italian restaurant and want to splurge that’s what I pick. Oh wow– I would love this!!! Bookmark! This sounds awesome. I always think, that’s one lucky hubby. You seem to make a lot of stellar recipes! Oooh, I probably would like this! I adore pumpkin! My favorite way to eat pumpkin….gosh. It’s a toss up between pumpkin cookies (I have 2 recipes, both are out of this world) and a new recipe I tried last year – pasta with a creamy pumpkin sauce and chicken sausage….mmmm. I just love everything pumpkin! This lasagna sounds so good! I am glad it ended up being a success. I love the idea of using pumpkin in a more savory dish. Hmmm, I tried pumpkin in my oatmeal after reading so many posts about it but I wasn’t crazy about it though. Still, that pumpkin lasagna looks good. I think that I would also have to find a substitute for the ricotta as well… And, dang, I want to come and eat at your house but I’m sure that you hear that frequently. I’m making freezer meals on Sunday and this one is going to be made. It sounds wonderful! As someone who loves pumpkin (but not even necessarily for its taste-which is still excellent-but more for its fall-ish-ness and nutritional merits! 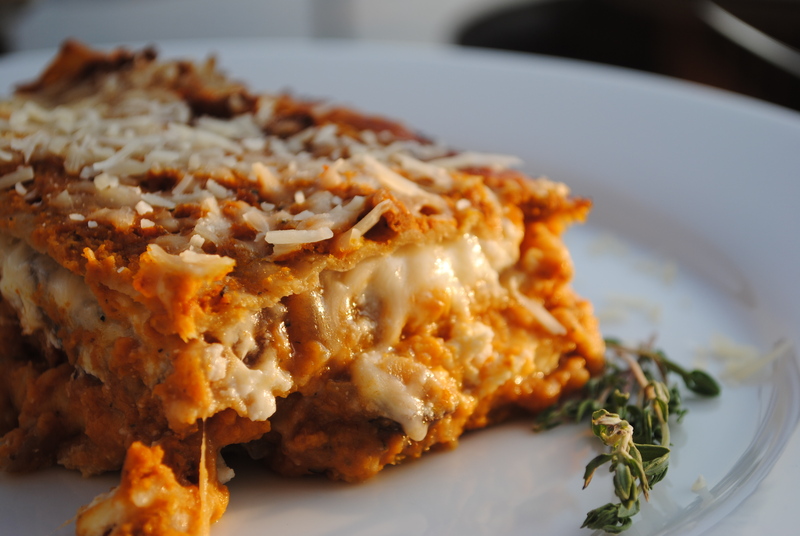 ), I can’t wait to try this pumpkin lasagna recipe. I was planning on making a butternut squash and sage lasagna, but since I have pumpkin, perhaps I’ll try that. Or maybe a mix of roasted butternut squash chunks and pumpkin sauce? We shall see. Never in my life would I have thought to put pumpkin in lasagna, but actually, it seems kind of genius. Hmm, that sounds…interesting. I’ll take your word for it that it was good! Pumpkin is all over the blog world lately. I never would have thought of doing pumpkin lasagna! I am a serious pumpkin addict, so this is definitely going into my recipe rotation! I might have to make the full recipe though…I don’t think I could ever get sick of it! Wow, does this lasagna look amazing! Pumpkin and ricotta are really great together. I hope Mr. Prevention has a wonderful birthday! Oh my gosh..I need to try this soooooon!!! Wow, this is right up my alley too – YUM!! I love everything pumpkin but usually stick to sweet rather than savory. I finally got a chance to make this – wow! It is delicious! Thanks, Kelly! 🙂 Appreciate it! Can I add any meat to this? MH wants meat with his lasagna! What do you think? I use zuchinni for the noodle instead of pumpkin, came out great. Just make like regular , but use zuchinni instead of noodles. Sliced lenthwise instead, and sort of fill in the gaps..Not fond of squash, too sweet. 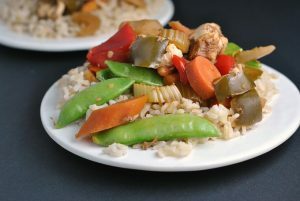 I just made this recipe tonight and REALLY liked it! Thanks for sharing! Thank you for posting this! Last year, I found out that I’m allergic to tomatoes, so I’ve been missing lasagne and all other Italian dishes. This came out great and totally satisfied my craving while preventing me from breaking out in hives. ha ha. I came across you from googling “pumpkin recipes” and pulling up the site, “100 Ways to Cook a Pumpkin at Endless Simmer. I don’t really like the sweet flavors that go into seasoning most pumpkin recipes so I was excited to find this recipe and made it tonight. It was delicious! My husband, who doesn’t like mushrooms, even really enjoyed it (I, on the other hand, had trouble not gobbling up the sauteed mushrooms and onions before they went into the recip). I’ve also made a batch of your buffalo chicken salad for lunch tomorrow. I’ve subscribed to your blog feeds through Feedly and am looking forward to what comes next. I love cooking healthy (I made this recipe with fat-free half & half and didn’t notice any issues) so I’m going to keep reading you and finding great new recipes! Thanks!! Thank you, Kristen! This recipe was pretty surprising to me, too…I loved it! I hope you find many more recipes you love 🙂 I’ve heard great reviews on the Buffalo Chicken Salad so hopefully you enjoy it, too! What about adding some meat in this dish? I think it would be a great idea. Mean will enhance its taste and makes it more juicy.